Here’s a terrific landscaping idea if you’re into natural health ideas – increase the value of your home while creating a haven that is private at the same time, with a garden full of beautiful, natural healing remedies. Having a healing garden will connect you to nature. A benefit that is often overlooked with having a landscape that is well-maintained is the health of homeowners is improved. And the garden itself can be calming and relaxing just to look at. Why not create a spot in your yard where the healing garden is the focus? You can add a small sitting area to enjoy the fragrance and the view, and perhaps a water feature for some soothing sounds. For centuries, plants have been used by humans for their properties of healing. What follows are common healing plants that you can place in your garden. However, as with all medications, ask a medical professional prior to using any herbal remedy. And of course since you’ll be using these plants for medical benefits, you won’t want to use pesticides or toxic fertilizers. With dandelions being thought of as weeds, they ended up with a bad reputation. However, they have great for treating arthritis, intestinal disorders, and eczema as well as being cleansing for the liver. Dandelion are also a diuretic that is effective and a great source to get potassium. Young dandelion greens make a great salad addition. Rosemary oil is helpful when used as an anti-fungal and antibacterial. Also, by improving circulation in the brain from rosemary oils carnosic acid, there is lower risk for Alzheimer’s disease. Plus rosemary can be used for cooking as well. You might already be familiar with the fragrance, lavender. But did you know lavender has properties that make it antiseptic and anti-inflammatory? It can also be be helpful when treating migraines, anxiety, depression, and insomnia. It is known to have quite a relaxing effect. Aloe vera’s clear gel treats cuts, burns, and skin infections. If you have a child with an upset tummy, lemon thyme is helpful. (As stated above, ask health care professional before using any herbal remedy). Lemon thyme also has properties that are anti-fungal and antibacterial. Coughs and colds can be treated with sunflowers. You may have heard of peppermint with helping nausea; it does this and so much more. This holds a wide range of benefits for healing. It can also help with pain, flatulence, diarrhea, irritations to the skin, sooth a headache, and aid in digestion. The leaves make a refreshing tea. You may be surprised that catnip not only relieves toothaches but it repels mosquitoes more effectively by approximately ten times than DEET, and much healthier. Mothers have used catnip tea for babies with colic for centuries. Catnip has the opposite effect on humans than it does on cats. Another insect repellent that is effective is sweet basil. This is also used in treating asthma, diabetes, and stress. Lobelia (Indian tobacco) not only produces beautiful flowers but has has lots of uses for healing. 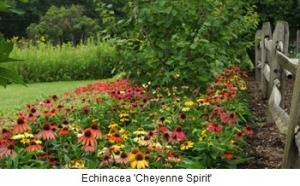 Echinacea is known to many as a healing plant, but do you know it by its common garden name, purple coneflower? The large, colorful blooms will add beauty to your medicinal garden. If you’re putting in a garden bed anyway, why not include some plants that have healing potential? These are just a few that you could use; there are many, many others. For the best results, hire a professional landscape designer to help you create an effective healing garden that has a host of remedies. Contact Architectural Landscape Design for our expert service. We’ll work with you to custom design a healing garden for your property that reflects your dreams and visions.